This is a strenuous trek / very strenuous climb of 25 days. Return trip to/from Vancouver including time in Kathmandu is 34 days. Best expedition time is October / November and April / May. Mera Peak is truly a high altitude destination. At 6476m or 21,247 ft., it is tallest of Nepal's "Trekking Peaks". With few technical difficulties, it requires more fitness and determination than mountaineering skills, to gain the summit. The climb and the view are breath-taking. For the non-climber, the Hinku basin offers endless opportunities to explore this magnificent high alpine landscape. The Hinku Valley is wild and barely touched, with few inhabitants and fewer visitors. Once in the valley, an expedition needs to be entirely self-sufficient. Our approach trek starts in Jiri. This gives the group more time to acclimatize while enjoying rich cultural exchange in the many Sherpa villages en route. As this trip follows the same route as the Everest Khumbu trek for most of the journey, you can read a more detailed travelogue on the Everest Khumbu page. Exploring Kathmandu with an afternoon Hindu and Buddhist temple walk. Dawn over Kathmandu from the hill-top Buddhist temple Swayambunath. Bus to Jiri - 2100m. If it's clear we'll have our first views of the Himalaya. Our trek begins with an easy day to Shivalaya 1780m. Our first night camping by the river. Bhandar - 2150m. Entering the land of the Bhuddist Sherpas. Sete - 2575m. The morning walk drops from Bhandar to Kenja at 1570m. then begins the long climb to the Lamjura La (pass). Sete is half-way up. Fantastic sunsets from an ancient crumbling monastery. Junbesi - 2675m. After lunch at the pass 3530m. we begin the descent to Junbesi. Inhabited by theSherpas for centuries, the land is rich and pastoral. The people are rich in culture and hospitality. Numbur Peak, 7000m, the home of spirits of protection, looms over the head of the valley. There are many gompas (temples/monasteries) within easy walking distance. It's a perfect place to spend an extra day. Junbesi - This is a rest / explore / washing day. Thubten Choling, the monastery home to 500 Tibetan monks and nuns is a 90 minute walk up the valley. The visit is fascinating and often very moving. Nuntala - 2250m. If the morning is clear, just around the ridge-end from Junbesi, we have our first view of the Khumbu Himal with Mera's triple peaks sailing high. After lunch, we cross the Trakshindo La 3170m and enter the Dudh Khosi (Milk River) watershed. Nuntala is halfway down the long descent to the river, which drains all the waters of Everest and the Khumbu. Pangum - 2846m. After crossing the Dudh Khosi and climbing to Kari Khola we leave the main route to the Khumbu and Everest and continue climbing east to Pangum. Not far from the "beaten track", the villagers of Pangum live a far more traditional lifestyle. Nashing Dingma - 2600m. At the Pangkungma La 3173m, the Dudh Khosi is behind us. Ahead the Hinku Valley is much narrower and almost as deep. The trail descends steeply through the terraces of Shibuche, clinging to the hillside. Finally, at the bottom, we cross the cable bridge slung across the canyon and begin the hard climb up. It's a relief to drop our bags at Nashing Dingma. Our awe of the porters continues to grow. This is our last village. 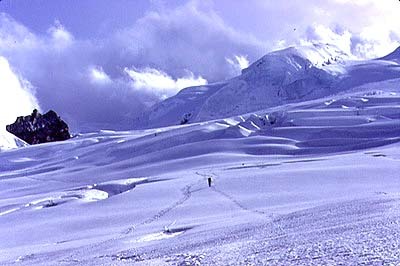 Chalem Kharka - 3600m. Another pass! The Surkie La 3085m. Ahead lies the huge Hongu Valley. It's a relief to turn north along the ridge, even if it's a stiff climb. Often in the cloud, the trees are thick with moss, in which orchids bloom in the spring. We're now higher than the Lamjura La, higher than Namche Bazaar. 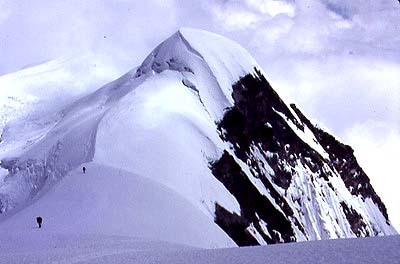 Chanbu Kharka - 4200m. The views become spectacular as we reach the treeline. If clear, Kanchenjunga is huge in the east. We come to Panch Pokari (Five Lakes). High mountain lakes are considered holy and are pilgrimage sites. Chanbu Kharka. It's time to let our bodies catch up to the altitude, and this is an exciting to spend a day exploring or just sitting and marveling at the views. Mosum Kharka - 3691m. Down the Hinku again. The flood damage is awesome. A lake above Tangnag burst its moraine walls and scoured the valley bottom. We join the trail from Lukla. It is the normal means of accessing the Hinku and will be our route of departure. Tangnag - 4360m. The huge cliffs of Mera are above us to the east and Kusum Kanguru soars to the west. At Tangnag, the valley has closed in and turns east as Peak 39 completely overwhelms the north. 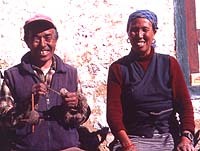 In 1992, Tangnag had a few stone corrals and some stone huts for summer herders. Now a crude lodge and some tea shops stand, a result of traffic to Mera. 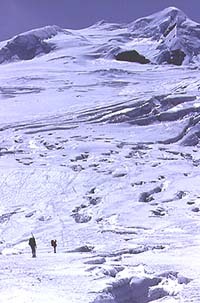 Dig Karka - 4650m. The world to the south is now filled with Mera Peak. Short climbs to the north give a clear picture of the challenge ahead. For those not climbing this is a great base for daytrips. The Hinku Nup glacier gives us a roadway into the heart of outrageous mountainscape. Dig Karka. 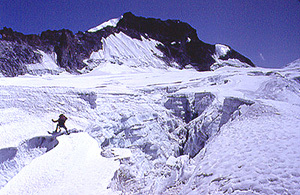 The climbers will head up to the toe of the Mera Glacier to reconnoiter and do some rope and axe practice. Mera La Camp - 5300m. We're on the ice now and going up! Walking up the glacier you can see the whole of our route ahead. At the Mera La the upper Hungu Valley is below us. One hundred meters below the pass is an excellent off-the-ice campsite with water trickles on warm days. Mera La Camp. We are in a perfect place to practice our techniques for snow and ice climbing. The weather is becoming ever more important. The sense of anticipation grows. Anxious and excited, keeping your breathing relaxed is difficult. High Camp - 5800m. Winding through bands of crevasses, we arrive at high camp at the head of a rock rib. The views are stunning. We're much closer to Everest than expected and we get to sleep here! Summit Day. As on every mountain, the weather is everything. Heading out into the open spaces towards Mera Summit leaves you very extended if clouds close in. If it's stable, we're on the move. No one is moving quickly at this point and it's a long way to go. When the summits appear we head for the middle one and get on to the snow ridge between it and the higher north summit. So close but it's a major effort as the ridge steepens towards the top and then you are there! The joy of not having to go up anymore merges with the thrill of being in such an outrageous place. Descent to Mera La camp: Ah! thick air. We always add a spare day to increase our options, health and weatherwise. Down we go to Tangnag or beyond. We turn up the trail to Lukla. New ground, but uphill! It's slow going working your way back up again, but the views back to Mera are dramatic. We cross over the Zatrwa La at 4600m. Then drop down towards Lukla. We're in the Dudh Khosi valley again. Depending on the group, we'll either push for Lukla or spend a last time in camp. 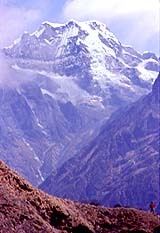 Lukla. Relaxing in the Paradise Lodge. A party for the crew. A round of beers and a very satisfied deep sleep. If it's clear we pile into a twin otter and tear down the six degree airstrip towards the abyss. "What a take off! What a flight!". Oh my God, Kathmandu! Eating and shopping seem to be the main preoccupations, until the crew give us a party we won't soon forget. Good luck refocussing on the western world!